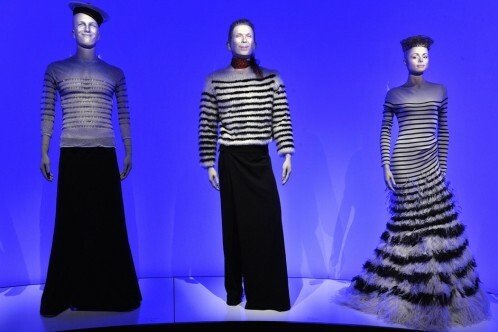 After Munich and Montréal, it is now the hometown of the fashion designer welcoming his ‘Jean-Paul Gaultier’ exhibition at the Grand Palais in Paris. Gaultier launched his brand in the 80s with his collection ‘ Grease’. It was a disaster. Hard to believe when, 30 years later, Jean-Paul Gaultier is a figure of the French Fashion scene who revolutionized the Parisian codes. The ‘marinière’, the corset, the tulle ballet underskirt, they all are fundamental items of the Gaultier aesthetic, but not only. The fashion designer doesn’t only create clothes, he reshapes the body expectations as well. Directly recruiting his runaway models in the streets, size and gender do not matter to scroll for Gautier. This extravagant yet chic way of composing his image is well established through this exhibition. From 1970 – his first steps with Pierre Cardin – to 2014 – and the creation of Junior Gaultier, JPG in the meantime – the exhibition presents exclusive pieces from the haute couture and prêt-à-porter collections, stage costumes, movies, runaway shows, clips, on the whole, an overview of everything that constitutes the Gaultier brand.